I’ve done a lot of traveling lately. My recent good times included driving across the country to move from Utah to Pennsylvania, a trip to New Orleans for FinCon, a day trip to New York City, and an overnight business trip to Kansas City. It’s been a little crazy, and each trip has been different from the others. As a result, I’ve been thinking of the ways that I make travel a little easier on me. It’s all about keeping what I need each day in one bag. Even on the road trip. I didn’t want to have to bring several bags into hotels each night, so I made sure that everything I would use regularly was in one bag. I also made sure that bag had wheels. This was a lesson I learned while on spring break with my son a couple of years ago. We went on a road trip, and we both packed duffel bags. By the end of the trip, we were cursing the fact that we had to carry those duffel bags to our rooms and to the car. They were awkward and heavy. No it’s all about the rolling bags. When I pack, I roll my clothes. This makes them smaller and easier to pack. Plus, if I roll my clothes carefully, they don’t get very wrinkly. Rolling my clothes allows me to use my space more efficiently, and it cuts down on the need to iron my clothing at the hotel. It’s also fast and easy to pack when I use this method. This simple trick has made travel much easier on my, whether I’m going for an overnight trip, or whether I’ll be gone for days. I hate bring carry-ons. It’s a pain to bring the carry-on through the airport, managing it as you get food or use the restroom. It’s difficult to find a place to stash a carry-on in the overhead bin. Sometimes, you have to put your bag in a place that’s different from where you are sitting. It’s all a big hassle. I’d rather just check my one bag (even if it is the size of an acceptable carry-on). If you fly Southwest here in the United States, you don’t even have to pay to check your bag. But, honestly, I don’t even care if I have to pay $25 or $35 to check my bag. It’s worth it for the convenience. I bring a personal item — my laptop in its case. I keep a couple essentials in the laptop bag along with the computer and that’s it. It fits easily under the seat in front of me so I don’t have to worry about getting into my bag later, and I don’t have to fuss with it when it’s time to disembark. One of the best things you can do to cut down on stress is to make sure you have plenty of time for travel. I get to the airport early enough that I don’t stress out while waiting in the security line, and so that I have time to walk over to a bench and put my comfortable shoes back on. When I go on a day trip, I check the train schedule ahead of time so that I have time to get to the station, find the right platform, and get settled on the train before it’s time to leave. A couple of unfortunate events involving rushing around at the last minute cured me of leaving late. Just make sure you have something to do. I bring along my Kindle so I can read, or I get some work done. It’s easier to cope with inconveniences when you have taken care of yourself. Try to get the right amount of sleep. Make sure you eat healthy food. Drink plenty of water. These are the actions that can keep you as much on track as possible. While it’s not always easy to take care of yourself when you travel, it can help to take some steps to avoid being totally unhealthy. That way, you’ll make better decisions, and be better able to handle some of the inconveniences that crop up. 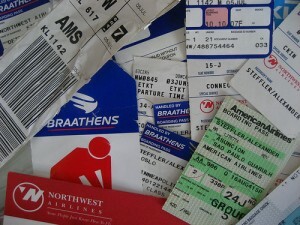 What do you do to make travel easier on yourself? I think eating healthy foods, getting some exercise, and trying to maintain a somewhat normal routine are all great ways to make travel less stressful. And, I like the one bag theory too–much easier when you consolidate! I think I need to learn how to roll my clothes when I pack. I try to eat healthy and get some exercise while traveling as well. Avoiding alcohol is also a good idea. Hmm .. interesting idea about the rolling of clothes, I need to look into this, since it might help with saving more space (a good thing when you also have a baby’s stuff to carry). Check, check and check. The only thing I would add is to make sure the single bag that you take is a small one: large or small, you’re going to fill it, so having a small bag ensures you choose carefully what what to pack and it forces you to travel light.